Transportation Costs > How Much Does a Taxi Cost? 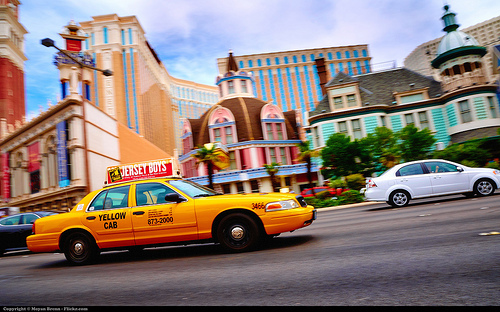 Taxi cab fares differ from city to city and are sometimes calculated in different ways. The following information will give you a general idea of what the cost of a taxi will be in an average city. If you would like to calculate taxi cab fares for specific cities or specific destinations, visit Taxi Fare Finder. Most taxis will charge a flat fee for any ride. This taxi price can vary from $1-$4. Some taxi companies then add a certain amount per 1/4 mile, 1/2 mile, or full mile. This cost usually ends up being between $1-$3 per mile. Therefore, if you need to travel 10 miles, a taxi ride will cost $11-$24. Other taxi companies add a certain amount per minute rather than per mile. This rate can be $.50-$3 per minute. Therefore, if you need to travel 10 miles and it takes 15-20 minutes to reach your destination, this ride will cost $11-$64. This type of cab fare is more common in large cities with much traffic; the congestion of cars on the road gives the cab companies a larger fare. The average trip in the United States will last anywhere from 5 to 12 miles. For example, the website Schallerconsult.com lists a wide array of prices depending on the geographical location. In a place, such as Honolulu, Hawaii, the average long trip can cost upwards of $40 while a long trip in Cleveland would only cost around $22. The website TaxiFareFinder.com allows you to input the starting and ending point to get a rather good estimate on what the taxi ride is going to cost in the area. YellowCabHouston.com, based in Houston, Texas, charges $2.75 for the first 1/11 mile. After, each additional mile will cost $2.20. If the driver has to wait, the cost can shoot up to $24 per hour. A surcharge will be applied to waits that are in between 8 p.m. and 6 a.m. Note: An initial fee of at least $1 to $5 will be charged on all fees noted above. So, a one mile trip in Tulsa, Oklahoma, could cost $4.80 if there was a $3 initial fee. When a taxi is occupied, the taxi driver will turn off the numbers on the top of the cab. To hail a taxi in any downtown area, just simply stand at the corner of the curb and stick your hand out in the air. Once a taxi pulls over, always get in the backseat and let the driver know where you need to go. Always be sure to save your receipt when getting out of the cab. You’ll want to keep this just in case something happens or if you want to report a driver. It’s also ideal to keep it just in case something was lost in the cab. If you need to call a taxi and ask for a pick-up at a specific location, this will usually be an extra charge of $5-$15. Hailing a cab on the street will not result in this charge. Taxi cab drivers also expect to be tipped. The tip is usually 15% of the total fare. For example, if your total fare is $30, you should tip the driver about $4.50. If there is going to be a wait time where the taxi driver has to wait for an extended period of time, the cost can be anywhere from $15 to as much as $40 per hour depending on the company. A premium surcharge may be applied for some companies during certain times. For example, if the taxi has to travel at night after 8 p.m and before 6 a.m., the fares may be 20 to 40 percent more. A fuel surcharge may apply, no matter how long the taxi driver has to drive. This rate could cost anywhere from $2 to $5 per trip. The best way to save money on cab rides is to share the cab with someone who is going in the same direction or even to the same destination as you are. If own a iPhone or Android, you may want to consider the TaxiMe app. This app will tell you exactly how much a taxi should cost. A great debate today is Uber vs. a Taxi. According to BusinessInsider.com, 99 percent of the time, Uber wins.